Find out how to use your existing Xbox One Kinect Sensor with a new Xbox One S or Xbox One X console. Find out how to use Cortana on Xbox One, how to use it to turn your console on and off, and how to revert back to Xbox commands. Not hearing any sound from your Xbox One Wired Headset? Find solutions you can use to fix this problem. Find out how to connect a compatible headset to your Xbox One. Learn how to set up and use the Xbox One Stereo Headset Adapter. Want to know about the USB ports on your Xbox One console? Learn what accessories you can connect to the USB ports on your console. Learn how to set up and troubleshoot your Xbox One Stereo Headset. See how to adjust the audio and microphone and update your controller to work with your headset. Learn how to attach an Xbox One Chat Headset to an Xbox One Wireless Controller. Learn how to use the Chat Headset with your Xbox One. Learn how to use your wireless controller like a wired controller with a USB cable. Learn how to troubleshoot the Xbox One Play & Charge Kit battery pack. Learn how to insert and charge the Play & Charge Kit battery pack, along with some troubleshooting tips. Learn how to set up, use, and troubleshoot the Xbox One Media Remote. Learn how to watch over-the-air TV on Xbox One. Learn how to set up and use the Xbox One power supply. Having trouble getting your Xbox One Kinect Sensor to turn on? Learn how to troubleshoot this issue. Want to control your Xbox One console by using voice commands? Learn about the available Kinect voice commands. Learn how to get your Kinect sensor recognized by your Xbox One S or original Xbox One console. Having trouble when you try to use voice commands? Learn how to troubleshoot voice command issues with your Kinect sensor on Xbox One. Having trouble with your Kinect sensor? Learn tips and tricks for troubleshooting Kinect issues. Before you set up your Kinect sensor with Xbox One, get a few helpful tips. Learn how to set up the Kinect sensor so that it automatically uses Kinect sign-in when you start your Xbox One console. Find out what to do when your Kinect sensor doesn't recognize you and doesn’t automatically sign you in to Xbox Live and your Xbox One console. Learn how to calibrate your Kinect sensor’s microphone so that it can hear you better. Learn how to plug the Kinect sensor into the Xbox One S or Xbox One console. Follow these health and safety guidelines to use your Kinect for Xbox One sensor for optimal fun and safety. Learn about glare, electrical safety, and more. 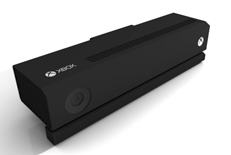 Find answers to frequently asked questions about accessibility, the Xbox One console and the Kinect sensor. Find out everything you need to know about the Xbox One Kinect Sensor including setup, positioning, voice and gesture commands, and troubleshooting. Get details on playing Xbox One games with wired USB mice and keyboards and find out how to use them to navigate your console more easily. Learn about how Microsoft uses your data to customize your Kinect experience the way you want it.